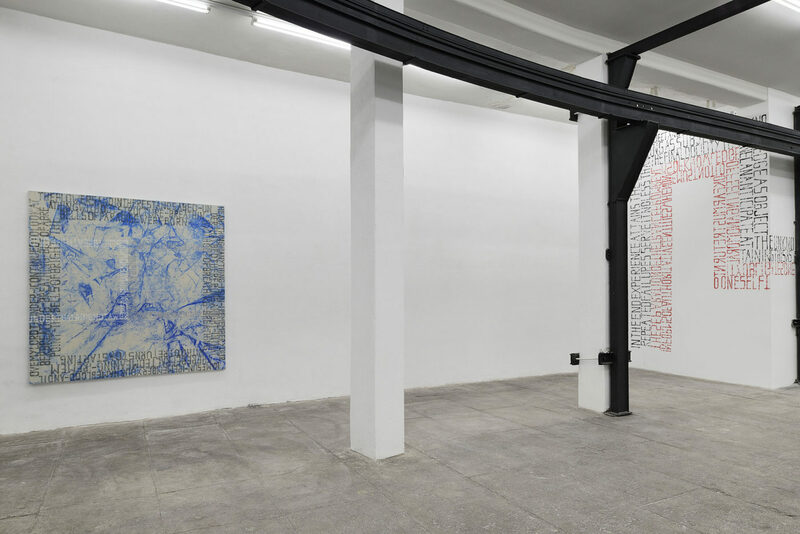 For his first solo exhibition at T293 gallery HEIM JUST, Herkenhoener further stresses the play between causality and authoriality that has always informed his research through the use of a surrealists’ technique known as ‘cut-up’. 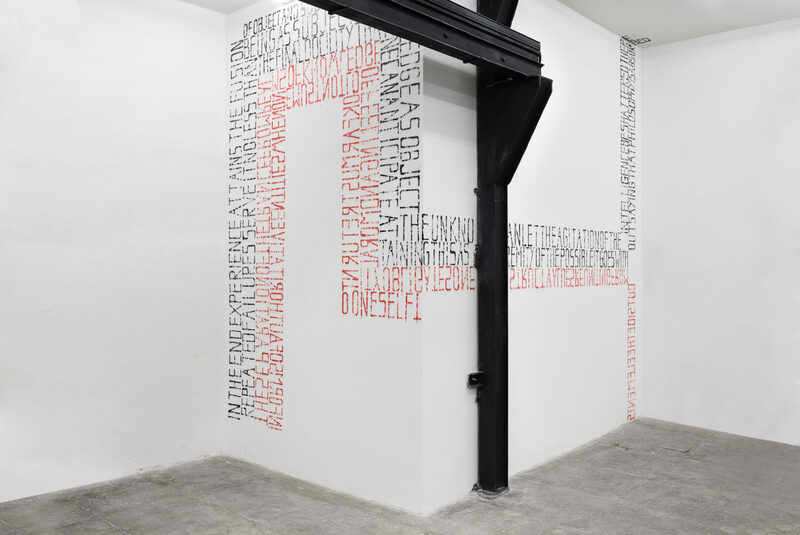 Popularised by T. S. Eliot and W. Burroughs, the cut-up is a literary technique in which a text is cut and then randomly rearranged in order to create a new text. 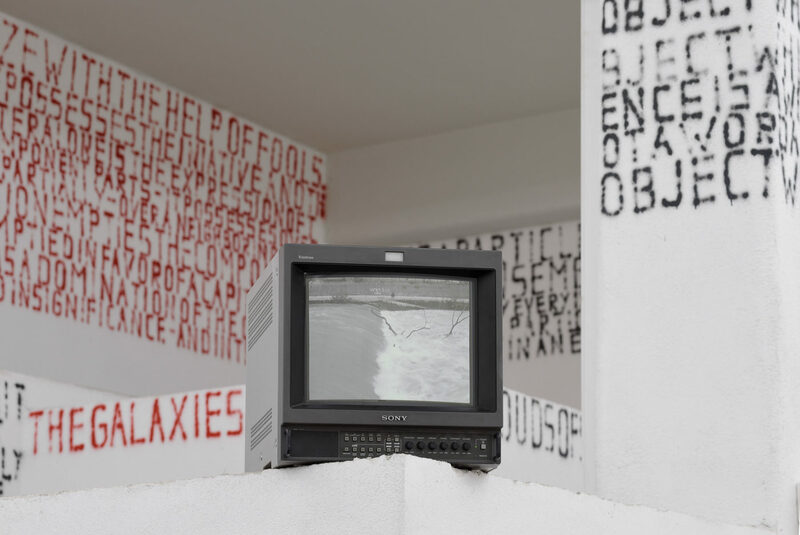 In this case, the text is rearranged by a software onto which the artist has previously inserted several selected texts along with his own writings. 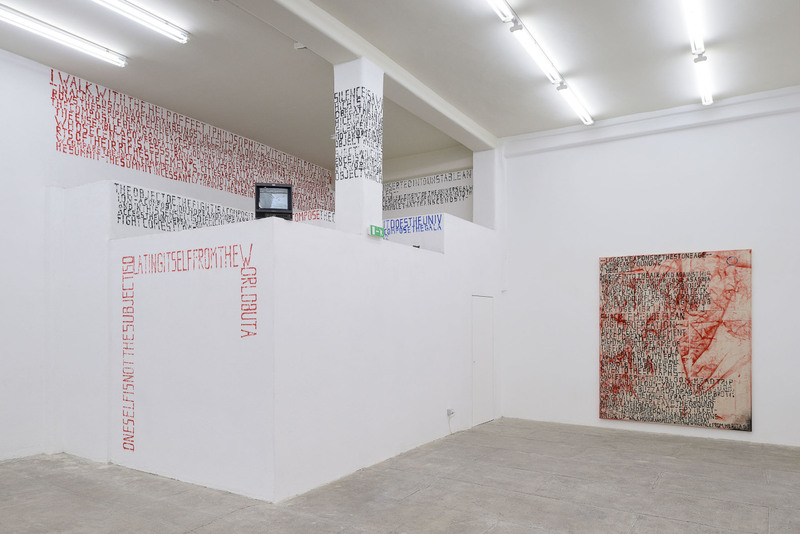 Herkenhoener has invented the expression ‘processing text’ in order to explain his artistic research: a research that arises from a specific context without never been completely subjected to the touch of the artist. Such process leads to the creation of a random language that refuses any rational or semantic hierarchy, albeit opening the path to new horizons of meaning. Indeed, in all his paintings and murals, the artist explores how to create the appropriate visual context for these illogical words to be fully experienced in their emotional and spiritual potential. 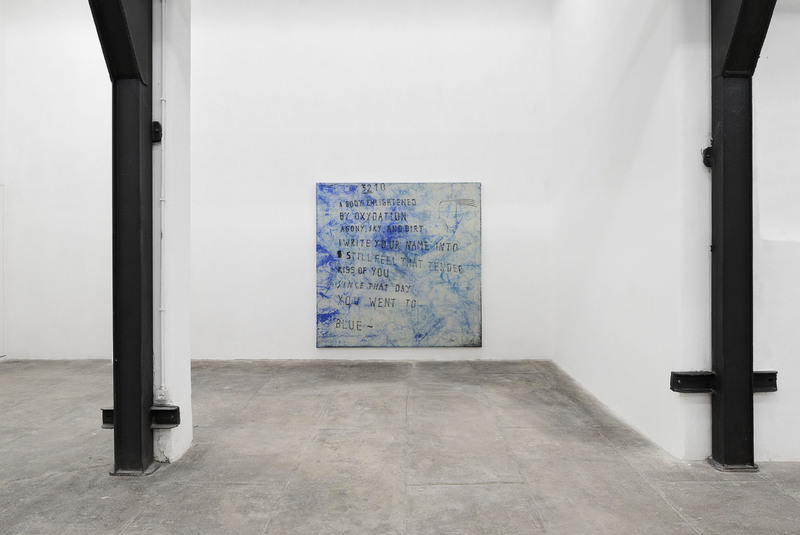 The processual aspect of Herkenhoener’s practice goes beyond the selection of the content of the works (that are texts and words, as said), and becomes more evident in the way such content is shaped. 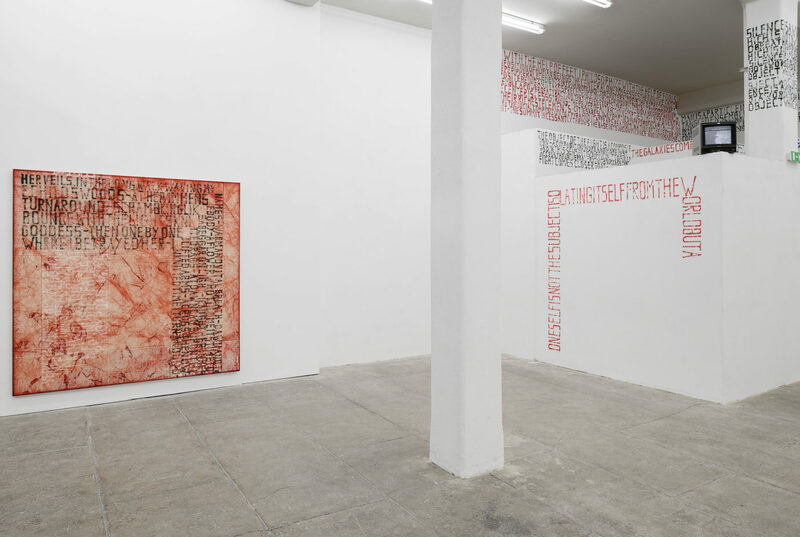 Specifically, in his latest series of works, words and extracts of randomly created poems take geometric forms or invade the canvas as grid-like structures that are meant to emphasize the mental and emotional dynamics that generated them. 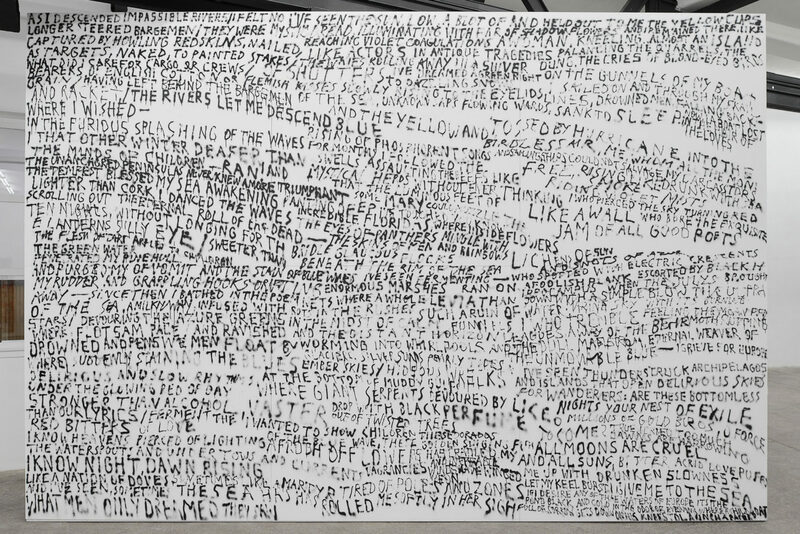 Sometimes the artist prefers to even lose control over the creation of the background of his paintings, being this background the visual context onto which these decadent-like free verse poems unfold and make sense. Indeed, his is a play with chance that transcends the form, and informs the way the process unfolds. 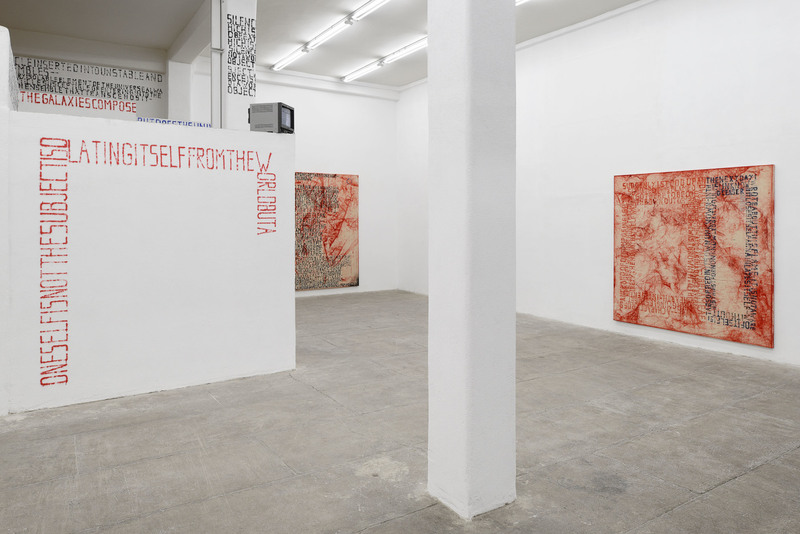 In Herkenhoener’s artistic practice, the disintegration of meanings follows the dematerialisation of the work of art that occasionally takes the form of a painting, a film or a performance, or all of the above at once. 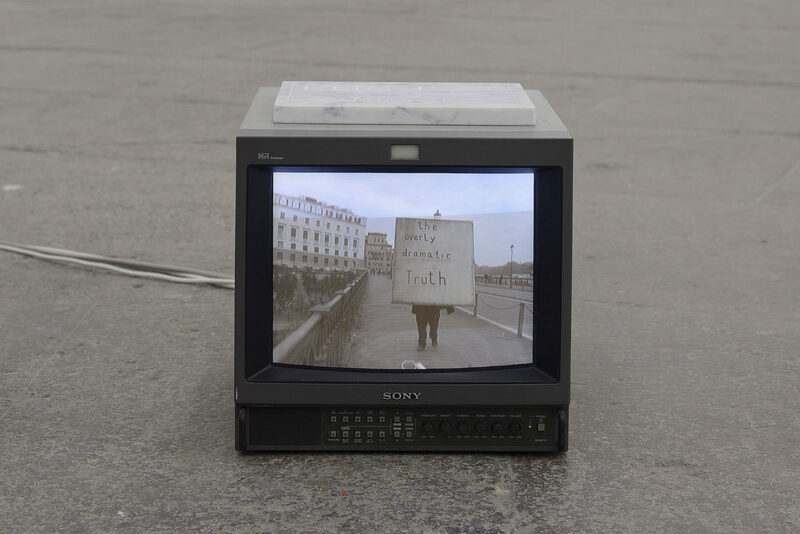 At T293, along with never-seen before paintings and site-specific mural interventions, the artist presents new video works recording the artist himself working on his paintings, or simply portraying with a steady camera some non-identifiable public statues or places. 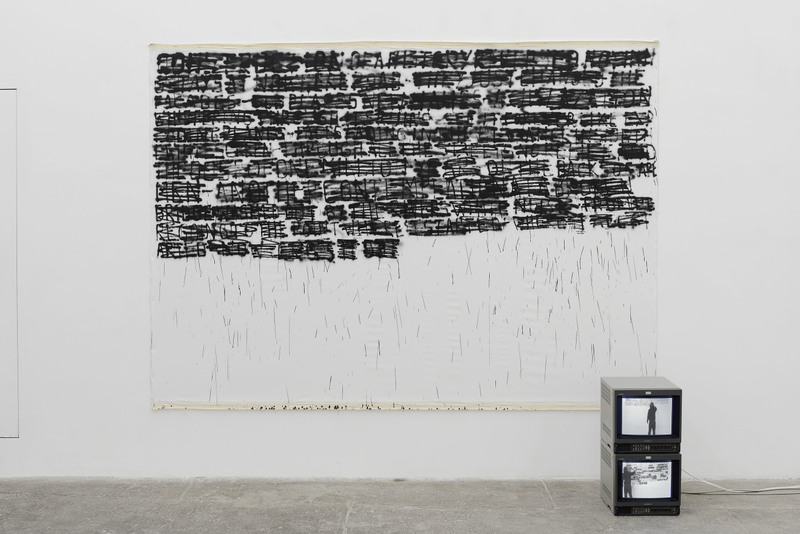 Undeniably, these works highlight the processual nature of Herkenhoener’s practice. 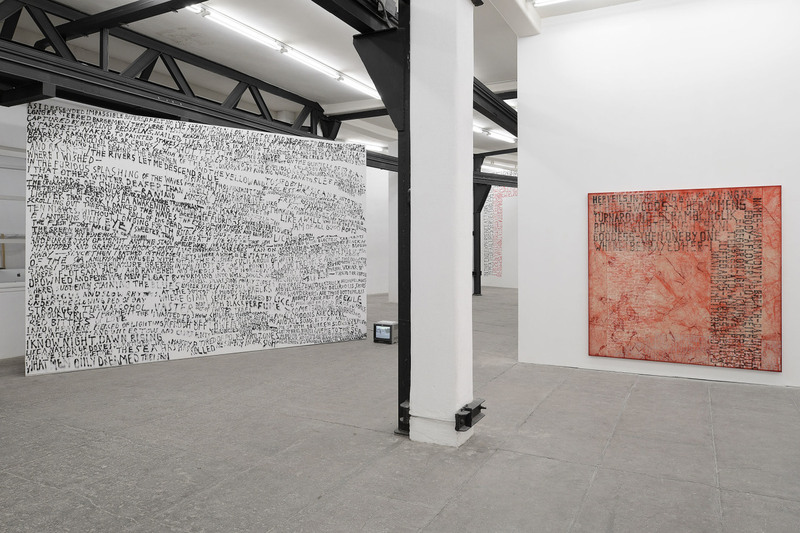 Moreover, they emphasize all the motifs nurturing his poetics that unfold in this show as a profound reflection on the human condition, and on the restless yet always apparent change that humanity as well as the world have to face. 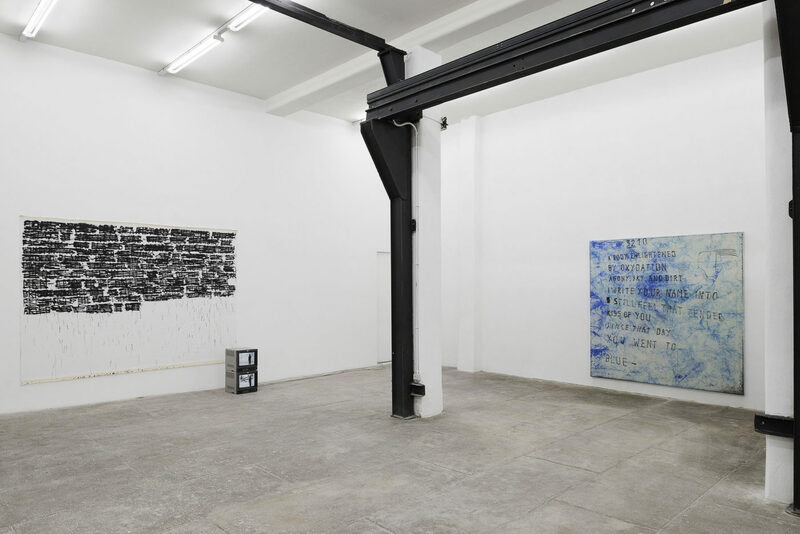 All these dilemmas are poetically summarised in the title of the show, HEIM JUST, which translates from German the English expression ‘Just Home’. This is a sentence that refers to an arrival, but also to a transition. It is a moment in a route that has still not reached its end, and that links together distant semantics; it tells about the withdraw of a spirit who has faced the complexities of the world, but that has also found a way to make sense of them, and transcend them by stepping through the door of his own intimacy.